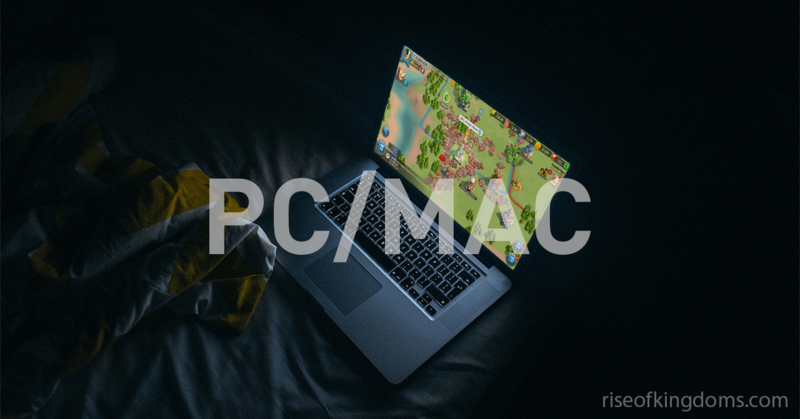 If you are looking for the easiest way to play Rise of Kingdoms on PC or Mac, look no further! Today, we are going to give you the fastest, the best way to download and play the most interesting RTS mobile game right on your computer or your laptop! All you need to do is just to click the download button and then install the file. 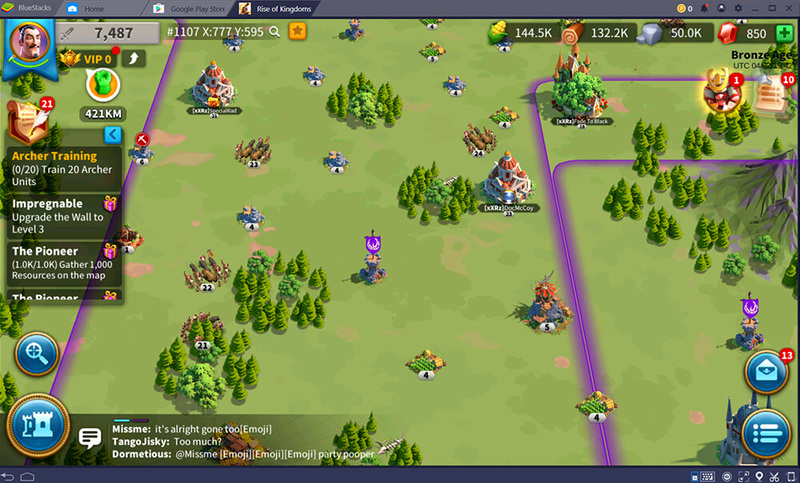 Since Rise of Kingdoms (RoK) is mainly designed for smartphones and tablets, most players do not know that they can play the game right on their computers with ease using Android emulator. Or maybe you have already known this, but you doubt that your low-end computer is not strong enough to handle the emulator? No worries, we are going to play RoK via Bluestacks, which is definitely the best emulator in the world for years now. Now, many people would ask me “Why don’t you use Nox, MemuPlay or some other well-known emulators?”. It is because Bluestacks is one of the very first Android emulators on PC. It was first developed in 2009 and the company was also founded in the same year. Quickly after that, they released the working alpha version in 2011. And then, throughout so many years, Bluestacks has been releasing hundreds of updates with a lot of life-changing features and improvements. They indeed have the best devs and the most smoothly working emulator! 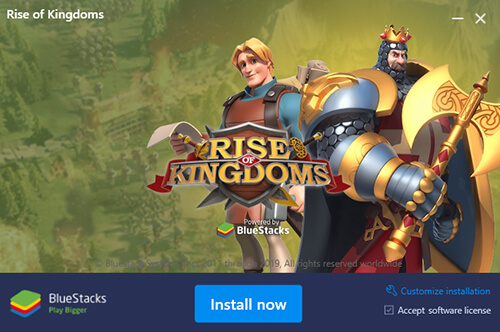 That is why I recommend using Bluestacks to play Rise of Kingdoms on your PC right now instead of the others. Note: Please do note that we will be using Android version of the game to play on PC. iOS accounts can’t be loaded using this tutorial. Easy to use: You really just need to click at the download button above and then open the file, the software will automatically download and install the game for you. Free to use: You don’t have to play any extra cost in order to play RoK on your computers/laptops/Macs. 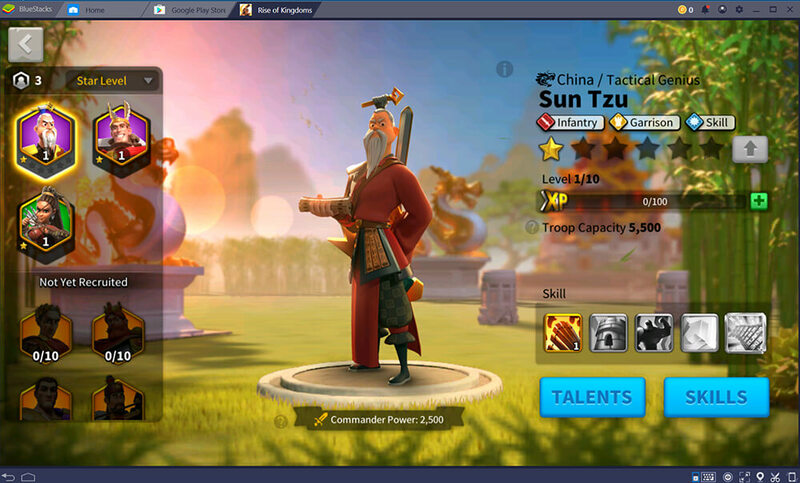 Simple UI: The UI has been designed a lot of times, giving the best UX to everyone using Bluestacks for not only games but also other tasks. Improved Keymapping: Well designed to help you do all actions in game via your keyboards instead of dragging the mouse on the screen. Thousands of default controls are already implemented for most popular games. Multi-Tasks: You can easily play multiple games at once and easily switch between them via the tabs. 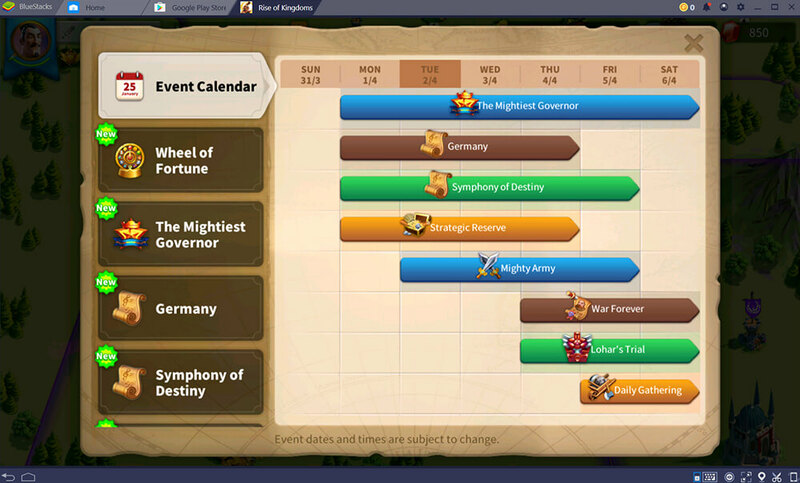 You also can easily play Rise of Kingdoms with multiple accounts at once, helping you process in the game a lot faster. 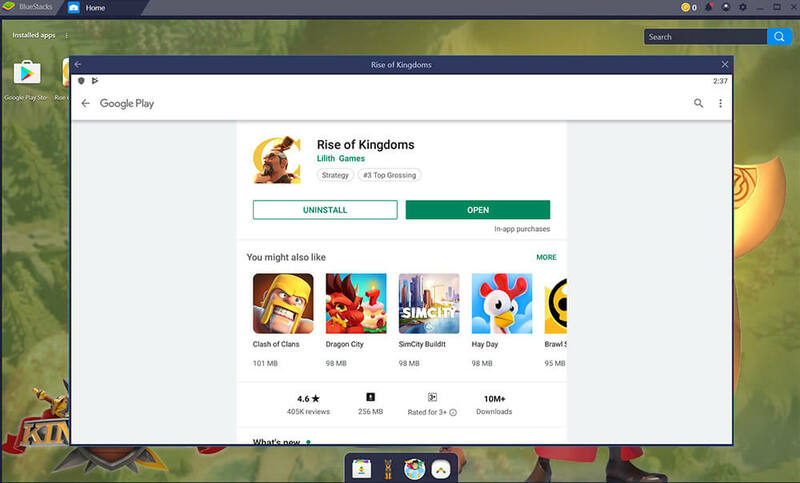 Streaming: Bluestacks already has the built-in streaming function, which helps you stream your game on Facebook and Twitter with just one click. How to Download and Play RoK on PC+Mac? Simply follow these simple steps and you will have the game ready in just under one minute! At first, you need to download Bluestacks, which will be used to install the game on. OS: Windows 7 or above; macOS 10.11 or above. HDD: At least 5GB of free diskspace. Permissions: You need to be the Administrator of the PC. Drivers: Up-to-date graphic & chipset driver. Note that above are the minimum system requirements. In order to have a better gaming performance, your specs should be higher. The file you downloaded in the step 1 should have the name like this: BlueStacks-Installer_4.xyz.exe. Double click on it to start installing the software! Click Complete to open Bluestacks and get to the next steps! Click LET’S GO. You can change the Language if you want. At the moment, Bluestacks supports up to 57 languages. Enter your Google ID to start. If you don’t have any yet, register one for free here. Google ID is required to use all of the essential functions of the emulator. Then click Start Using Bluestacks to get to the next step, installing the game RoK version for PC. 3. 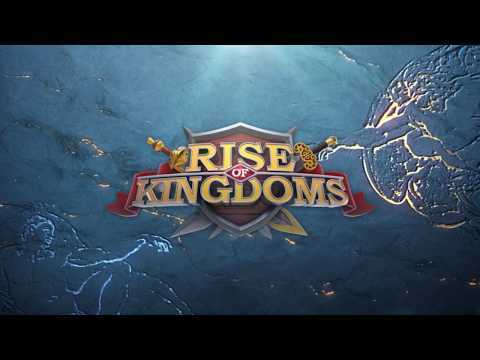 Start Download and Installing Rise of Kingdoms! Press Install to start installing the game. Just easy like that! The game is being downloaded. This should take less than one minute depending on your Internet connection! Let’s click Open and play the game! 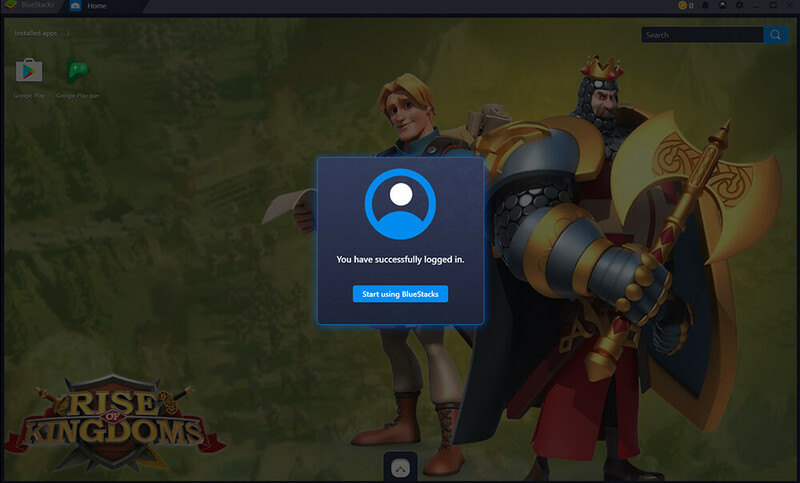 After this step, you can easily find the icon of the game on your PC’s Desktop and also right on the main screen of Bluestacks! It’s so awesome right? 4. Let’s play Rise of Kingdoms! The game is running smoothly now! 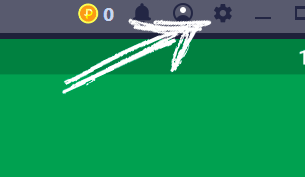 If you already have an account of the game, click the Login button located at the top right of the game screen! 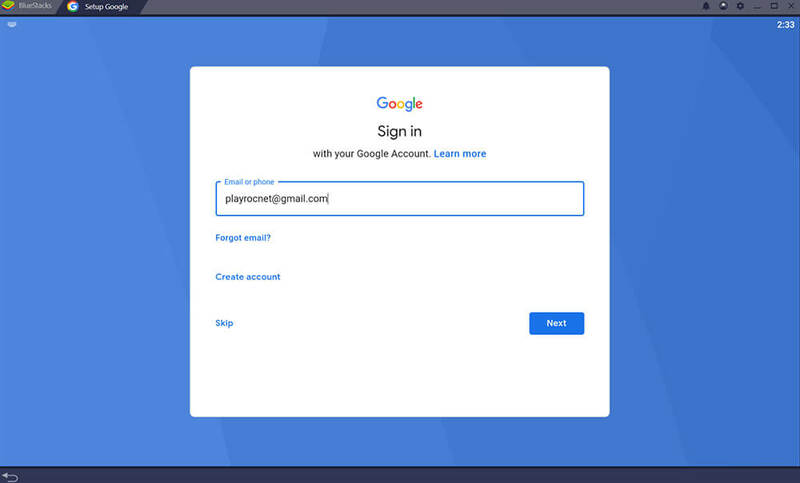 You can either Log In with your Google account or your Facebook account! Excellent! My game account has been successfully loaded! 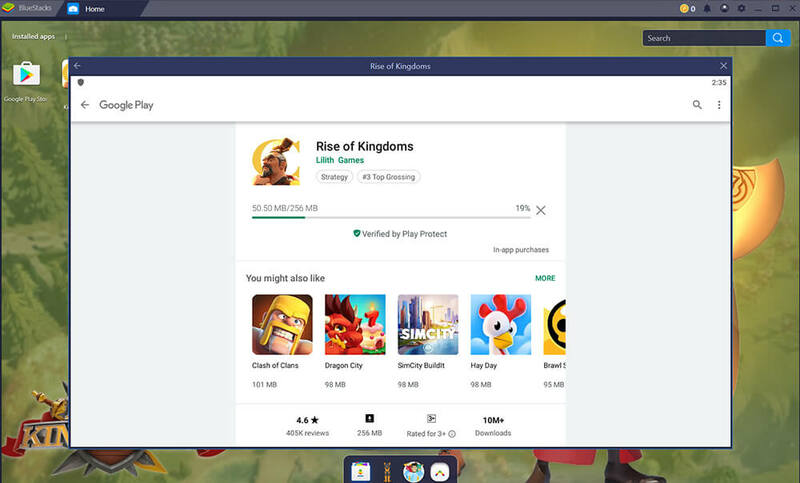 So we have successfully installed the game Rise of Kingdoms right on the PC computer using Bluestacks. If you are using a Mac device, you can follow this tutorial as well. At the first glance, the game is loaded very fast within seconds (approximately speed of my iPhone X). Also, as you can see here, the game uses a very little amount of resources while being idle. How crazy it is! If you have any question, feel free to comment down below and we will do the best to help you out! Can I load my iOS game account on PC? For now, you cannot do that. iOS accounts can only be loaded on iOS devices. The same thing applies to Android account. You can only load the Android account on your PC version. Bluestacks seems very slow on my PC. Is there any way to fix this? Make sure you have enabled the Virtualization. If you haven’t done it yet, check out this very simple tutorial! This is usually the main reason causing lags. Try to give the emulator more RAM and CPU via the Settings menu. Remember to restart the Emulator after applying. Upgrade your Chipset and Graphic Card driver. Some Anti-virus Softwares might cause this issue. Try to whitelist Bluestacks first. Also, make sure your AV Softwares are not disabling the Virtualization function of the hardware. My screen is too big! 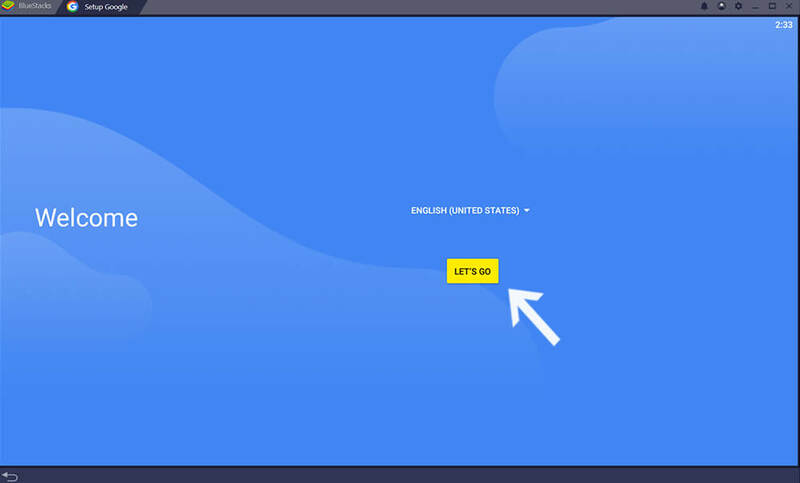 How to change the resolution? Firstly, go to the the Settings menu which is located at the top right of your screen. Then, you will see the Display tab with some default values like 1280×720, 1920×1080 etc. 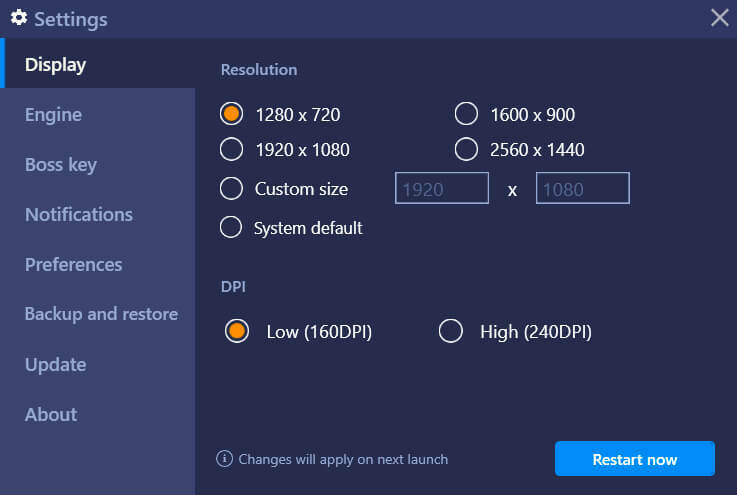 Or you can even use any resolution you like with the desired DPI. How can I adjust the CPU and RAM of the emulator? Go to the same Settings menu as mentioned above then go to the Engine tab. You can find the options to change your CPU Cores as well as amount of RAM here. My PC has only 1GB of RAM. Can I play RoK on my Desktop? Yes you absolutely can do that as it matches the minimum system requirements for running the software. Check out the requirements we mentioned at the beginning of this article! How can I take the screenshots in game? Taking screenshots while playing is extremely easy. 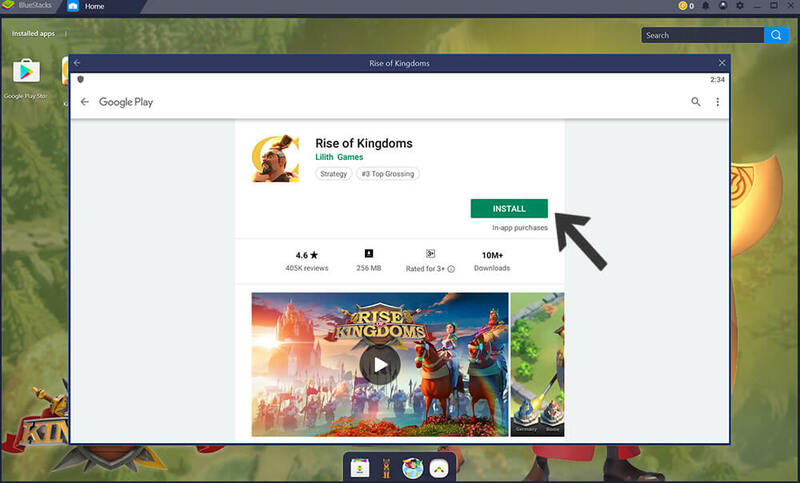 The screenshot icon is located at the bottom right of the Bluestacks window. Simply click on it to take a snap shot of the screen. The screenshots will be automatically saved in the Desktop, or any folder you want by setting via the Settings menu. Processor: AMD or Intel Multi-core CPU with Virtualization Extension enabled in the BIOS. HDD/SSD: At least 8G of free Storage. 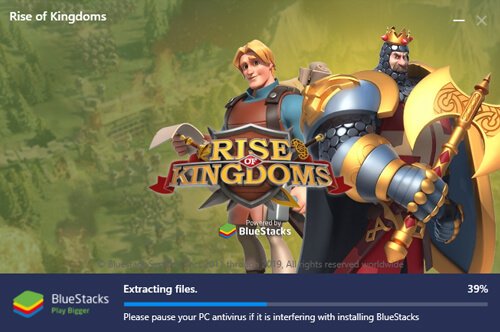 If you face this problem when trying to install Bluestacks, seems like the current version of Windows you are using is not supported by Bluestacks. You probably want to install the easier version of Bluestacks, the Bluestacks 3N. Bluestacks 3N supports both Windows 32it and 64bit while version 4.0 only supports Windows 64-bit version. How to install the other games or apps? Open the Google Play app then search for the app you want to install. Download the APK files of the apps on your PC/Mac then open with with Bluestacks. Your computer could be set to the Power Saver move, which could slowing down the speed of Bluestacks a lot! In order to adjust the power setting, open the Windows menu by pressing the Windows button on your keyboard, then search for Power Options. On the Power Options window, make sure that you are enabling the High performance mode instead of Power Saver or Balanced. Don’t forget to restart your computer after applying the settings. How to force the Emulator to always use GPU? If you want the emulator to use your GPU all of the time for the best performance, simply go to the Settings menu at the top right, then go to the Engine tap and check the Use dedicated computer graphics box. Save the changes then restart the Emulator. Popularly known as the Rise of Civilizations, Rise of Kingdoms is a game that gives you the responsibility of being a Governor where you are put in charge of a growing empire. The responsibility of developing the city’s military power as well as unlocking new technologies is in your hands. At the start of the game you are taken through a simple tutorial. You are required to pick one of the eight civilizations; Britain, Rome, Germany, Korea, Japan and Spain. After that it’s just orientation where you are taught how to build your farm, how to recruit your hero and how to defeat local barbarians. Once you have gotten a grasp of what the game entails then you will be free to expand your own empire. Through making proper use of the resources at your disposal and your army while building your population, you will start battling major civilizations within no time. Rise of kingdoms pc version is a strategy game that uses a simple set of rules. Therefore, understanding the mechanics of the game is very essential. There are four basic resources when it comes to Rise of Kingdoms that is stone, wood and germs. Each of them are very intuitive with new units that require food, military improvements and defense upgrades that require stone. The most important improvements that require all the three is the walls of your city. The game allows you to make upgrades every now and then using their digital currency known as gems. At the start you begin with 300 gems however you can purchase more if you need while you play the game. You also get to earn gems when completing certain tasks which gives you a lifeline from time to time. As you play the game you will earn resources which are obtained through collecting from them from your farm, quarries, sawmills and by completing quests. After sometime you will be harnessing thousands of food and units per hour enabling you expand even more. During construction the things that are required include resources, time and a builder. The importance of the upgrade determines the time and resources required. With this kind of upgrade you get to enjoy a lot of breathing space later in the game as you get to manage your increasingly complex civilization. There are many structures that need upgrade in the game including hospitals and academies. The city hall is the most important structure that needs regular upgrading. Yes you can upgrade the other structures but they will not rise higher than the city hall. Every time you upgrade the level of the city hall you get to unlock more units and building for your civilization. There are three distinct types of buildings in the game of Rise of Kingdoms. There are quarries where you get to grow your empire, there are economic buildings such as academies and there are military buildings like stables and archer ranges that lets you build your military power. Lastly, there are aesthetic buildings which are just meant to increase the appeal of your civilization. Combat in the game is very simple, all you need to do is select your target on the map, choose the type of hero that you want to lead your troops and watch them make the take care of the rest. The animations are also very simple nonetheless, the feeling of victory is just satisfying. In the game you will be given a score which is a combination of all your units and this is a great determinant in your battle outcome. As much as it may sound very simple, the games online play makes it much more fun and intuitive. You are now done with the tutorial it’s time to get into the real world of online gaming. Here you will get to interact with other online players, make alliances with them, and have a glimpse at their towns as well as battle with them. You will be very vulnerable to attack which means that you will need to build your own defense systems right. The game requires one to build your military strength as quickly as possible as you only have a grace period of around 8 hours. This can be achieved through forging alliances, taking out barbarians and completing quests. What rise of kingdoms does right with the PC version? For a mobile game that is as robust as Rise of Kingdoms, new strategy players will have an easy time getting to understand the game while veterans will love the casual speed. You have plenty of to do in the game during each session as you get to switch your attention between food, stone and wood. Collecting your resources is also very satisfying and planning your upgrades is very exciting. Combat in the game is very straightforward and simple as you get to battle raw strength and streamline the entire combat system. It also encourages you to take advantage of the alliance system where you work with other online players to take down enemies and defend your town. The alliance system is a welcome bonus in the game as it makes social play very interactive and intuitive. The alliances basically enable you to get research assistance, military aid as well as you can send troops for a share of your bounty. 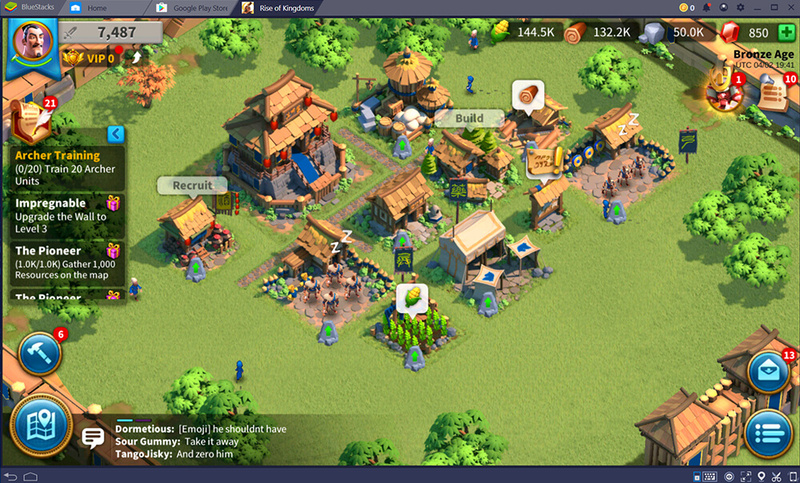 Rise of Kingdoms is a mobile strategy game that has a very casual experience. Complex mechanics of a real strategy game are replaced with streamlined construction systems and resources. The animation and art in the game are also underwhelming. As much as it can give you the glimpse of a strategy game it cannot fully compensate the fun and experience of on strategy gaming. 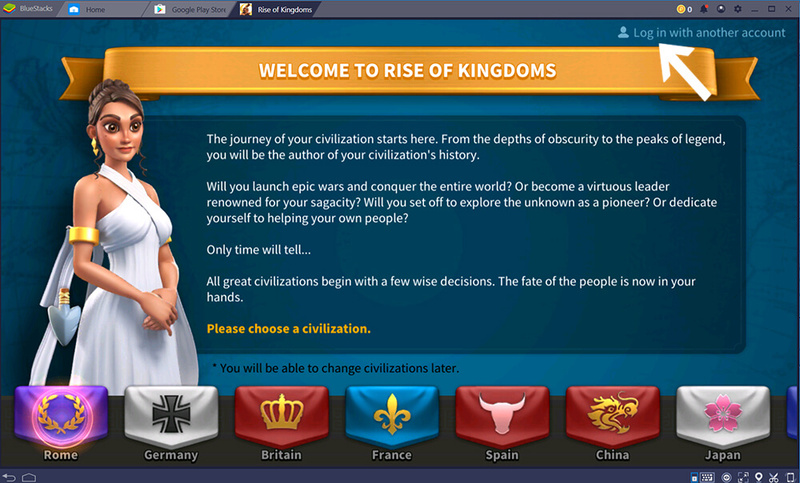 Rise of kingdoms pc is a very interesting and enjoyable strategy game. It combines simple resource systems with timer based construction where players get to feel like real kings expanding their empire. The strategy experience that players get from the game is very intuitive. Slaying some barbarians and building your own defense system makes them game fun to play.